Pretty much as soon as I moved to Munich ten years ago, I realised Bavarian beer was superior to the English stuff I grew up on and clearly the best in the world. It took me until this year to appreciate that the neighbours aren’t too bad at it either. As my wife and I have been spending more time in the mountains, one apres-ski activity we’ve taken to enjoying is trawling Austrian supermarkets for obscure local beers to sample and take home with us. Schladminger Bier, for example. We discovered Schladminger Bier last weekend whilst showing the Alps to some friends of my wife who are visiting from Moscow. A great time had by all, including dinner on Saturday evening in Hotel Matschner in Ramsau, where they had a superb weizenbier (wheat beer). From the label it appeared to be local, and my wife thought the beerglasses were cute and wanted to buy one. She asked the waitress, who asked the hotel manager, who wasn’t sure. So, at nine o’clock on Saturday evening, he called the wife of the brewer (who turned out to be in the very next village). Of course, she said, give the lady a glass. So I am now morally obliged to advertise her husband’s beer on my blog. I hereby unreservedly advertise the Schladminger Brewery, especially their wheat beer “Schnee Weisse” (“Snow White”), and also Hotel Matschner in Ramsau. Nice people, good food, outstanding beer. 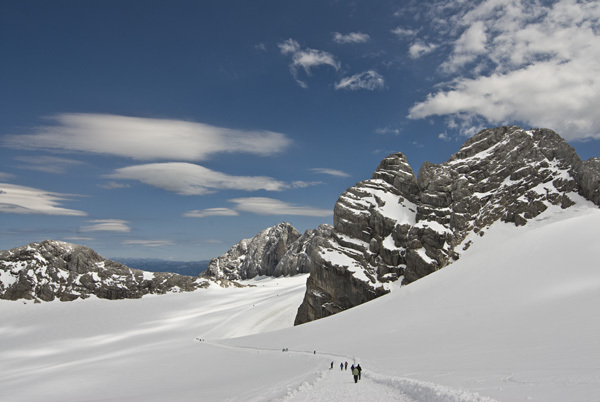 You don’t have to go to 2,700 metres on the Dachstein Glacier to enjoy Schladminger Beer. But should you want to, it’s available at the mountain hut just to the right of this photo. The weizenbier was sold out on Sunday; the other Schladminger beers turned out to be good too, although the weizenbier is definitely the star.